With a press blurb that mentions both Pink Floyd and David Bowie, I couldn't wait to slam this one into the tray and see what was on offer. Scotland's Preacher is a six-piece Progressive band that peddles its wares in the statelier Prog that PF have mainly dealt with. 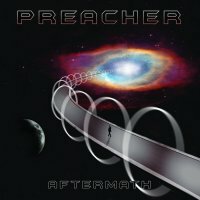 'Aftermath' is Preacher's second album and sees them pushing themselves on from their excellent debut album 'Signals' some two years ago. The star of the show on this album is undoubtedly guitarist Greg Murphy with some excellent David Gilmour-like licks, particularly on 'Welcome To The Party', where he really does give it some and a little more. The Hammond sounds on this track also give it a real Pink Floyd flavour – marvellous. Vocalist Martin Murphy does, on occasion, give off a David Bowie vibe with his phrasing and it does at times seem a little too incongruous but that's splitting hairs really. 'Vinyl' is a paean to times gone by and reminisces on the days when a vinyl LP was a real object of desire, and the track is a most enjoyable romp. Throughout, the female voices compliment Murphy really well, lending even more credence to the Floyd-isms going on. That's not to say that the album is a straight Floyd tribute, far from it in fact. There are enough of the band's own sounds to make this a really enjoyable listen and it demands repeated plays. There is nary a misstep on the album throughout and the standard stays high; with a nice fat, juicy production, the band has an excellent album on their hands. If your penchant is for Melodic Prog then this is an album that will go down very well, thank you.